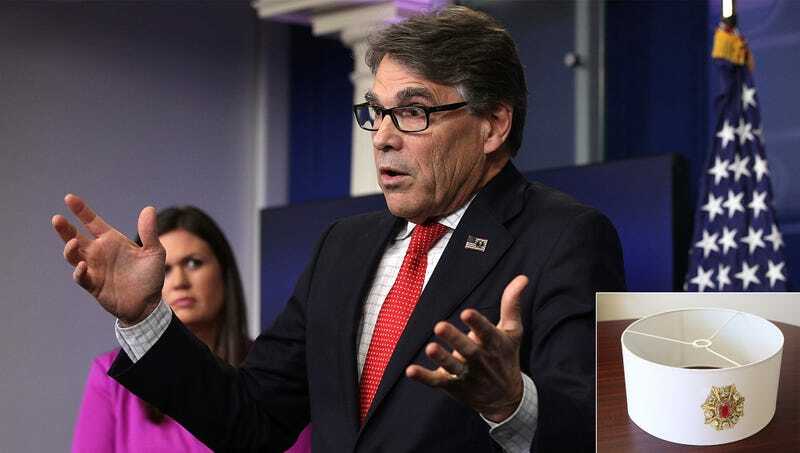 WASHINGTON—Admitting that his competitive spirit got the best of him, Secretary of Energy Rick Perry apologized Friday for trying to outdo his fellow cabinet members by spending $72 million of taxpayer money on a lampshade. “I deeply and sincerely regret becoming swept up in the office-decorating fervor of my colleagues and subsequently allocating over $70 million of my department’s budget for this lampshade,” said Perry, who admitted he ordered the shade from an antiques agent in Paris’ Porte de Clignancourt district to impress other cabinet members after seeing Ryan Zinke’s cocobolo-and-stingray-leather office door and the lavish Moroccan tapestries hung throughout the waiting area of Ben Carson’s “Desert Caravan”-themed office. “American citizens should not have to shoulder the cost of paying for a lampshade woven from vucana silk, hand-stitched with contrasting saffron-spider thread, and crowned by the world’s seventh-largest ruby, so I will be returning the lampshade in its lacquered presentation box as soon as a Learjet can be chartered to convey it.” Despite parting with the lampshade, Perry will keep the the lamp itself, which his grandfather fashioned from a football-shaped Jim Beam decanter commemorating the 1964 Cotton Bowl.